Wire is a awesome flexible material which can be literally be stretched out practically straight then bounce back to its original shape. Wraps easily around any wrist size or just slide it over your hand. with wear it adjusts nicely to the owners perfect fit. Great gift for anyone & everyone!! Also great for bridesmaids. Handmade Beautiful Bracelet with Superior Quality Freshwater Pearl 5 strnds Bangles Bracelet & Matching Earrings. 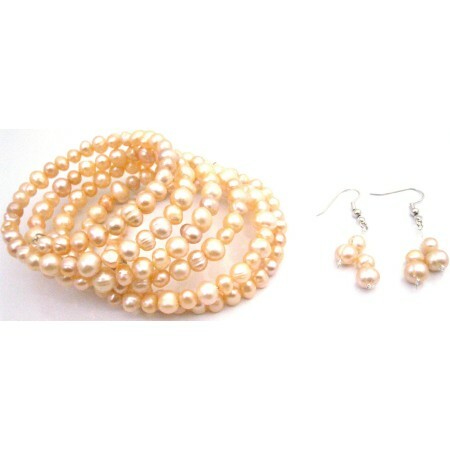 Peach Freshwater pearls Bangle Bracelet & Earrings. All A Grade Pearls are used to make this Gorgeous Bracelet & Earrings Set Wedding Jewelry Bridesmaid Collections theme of Gift with very high & classy quality of Freshwater Pearls & look sophisticated.